Nov. 1, 2010 - Brasilia, DF, Brazil - Dilma Rousseff, elected President of Brazil by ruling Workers' Party, leaves her house to be interviewed at Record TV studios, in Brasilia, center-western Brazil, on November 1st, 2010. Dilma won the run-off election with 56%, against 44% of the opponent candidate Jose Serra, of Brazilian Social Democracy Party. She will takes office on January 1st, 2011. With her victory in Brazil's Presidential Election, Dilma Rousseff joined the ever increasing group of women worldwide chipping away at the highest of glass ceilings. Though women leaders in eras past usually inherited their positions (see: every queen ever), recent female leaders have often followed more tortuous routes. Fifty years ago, when the modern world's first female head of government was elected, her victory was so groundbreaking, no one knew what to call her. "There will be need for a new word," London's Evening News wrote the day after Sirimavo Bandaranaike was elected Prime Minister of Ceylon (now Sri Lanka). "Presumably, we shall have to call her a Stateswoman," the newspaper added. When Indira Gandhi was elected in 1966, a TIME cover line read, TROUBLED INDIA IN A WOMAN'S HANDS. Those hands went on to steer India, not without controversy, for much of the next two decades, until Gandhi's assassination in 1984. In the Philippines, the pious Catholic widow Corazon Aquino helped topple the dictatorial regime widely blamed for the assassination of her charismatic husband and became President (and TIME Person of the Year) in 1986. In governments often marked by sexism and a dearth of female colleagues, women often had to form a tough exterior to gain respect. The classic example is Britain's Margaret Thatcher, Prime Minister for 11 years, known as the Iron Lady. During her tenure, she enabled the rise of the privatizing, capitalist state and saw the collapse of the Soviet Union. Germany's Chancellor Angela Merkel spent decades being underestimated by her male counterparts (Chancellor Helmut Kohl called her "the girl") before she became the first woman to lead the powerful European state in 2005. 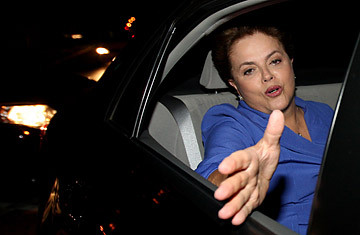 It's clear, as Rousseff said in her victory speech: "Yes, a woman can."